Even under extreme working conditions: WorkMaster will meet your requirements by way of comprehensive chemical protection and enormous robustness. Apart from exposure to chemicals, the protective suit is often adversely affected by one or more of conditions such as tensile stress, abrasion, exposure to heat etc. during work within chemical tanks, at pipeline systems or any other narrow rooms. Any of the above mentioned conditions may result in the protective suit being restricted in its efficient operation. If during such activities a loss of the protective effects was experienced the users health could be in severe danger. The chemical protective suit WorkMaster pro is protecting you throughout due to the fact that those are exactly the situations that WorkMaster pro has been developed for. The newly developed material called Himex makes this use possible in such conditions. It is nearly impossible to find such a combination of resistance to both chemical exposure and mechanical stresses. Some suits tear if they catch on a sharp edge which could result in loss of protection. Strong mechanical stresses such as climbing under trucks or between chemical tanks can also cause tearing. In both situations Himex will remain intact thus remaining its chemical protection. You know the phenomenon of deflagrations suddenly occurring at work. Even now Himex is protecting the wearer sufficiently. Donning of the suit is made easier by the zip fastener ending at the shoulder. The sunken zipper (being provided with teeth made of stainless steel and a Himex covering flap) is to be closed from top to bottom, thus ensuring it is completely closed. If you examine WorkMaster pros manufacture and accessories you will recognise that WorkMaster pro has been purpose built for such arduous work situations. In order to guarantee the resistance of the fabric to hard working conditions all seams are double stitched and are sealed chemically tight by fabric strips overlaid on both the inside and outside. The steel toe caps provided in the interchangeable safety boots prevent foot injuries caused by heavy objects falling on them. Viton gloves, resistant to chemicals, may be replaced within a few minutes and without any additional tools. Nevertheless this modern glove connection is capable of withstanding more than 30 kg of tensile force without loosening. While maintaining a high level of robustness the repair and service features as well as economic efficiency are in no way diminished. In fact after only a short cleaning an disinfection of the suit the WorkMaster pro is ready for use again. WorkMaster is made of the newly developed material called Umex which is ideally suited for use in working conditions where the hazard is known or subject to control such as acid, lye or chloric gas. This protective suit guarantees high wearer comfort and sufficient chemical protection. 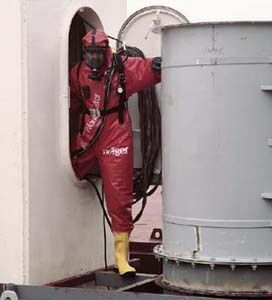 The bright red colour will ensure visibility even in dark or vapour saturated environments. WorkMaster and WorkMaster pro are the latest state of the art in chemical protection. Due to a wide range of modifications available both versions are suitable for your work.